I'm only 9 weeks, but I look like I'm 15-20!! 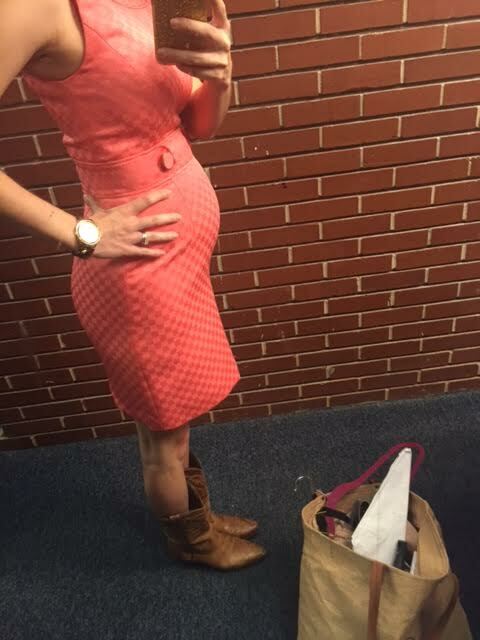 This was taken during week 7...yeah...I know...They say you show earlier after your first pregnancy, but DANG?!?! 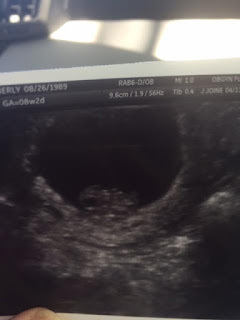 I knew I was going to be nervous to make sure everything was okay, but pregnancy hormones and emotions decided to make this a 'next level' experience. The poor sonogram tech didn't know what she was getting into. As soon as I laid down on that table in a dark room, the flash backs to the last time I was in that position were all a little too real. Instant waterworks. And hearing the words, "Everything looks good! There's only one in there. Here's the head, arm buds...heart beat.Heart beat looks strong..." As much as I've reasoned with myself that it's all going to be okay, or that it's okay if it's not all okay, whatever Psychology 101 I've decided to dose myself with that week, I just wasn't prepared. I couldn't get a grip. Ugly sobs. But along with uncontrollable emotions, heartburn, and constant nausea, Holy. Exhaustion. Well, that's the best comparison I can give you for how I feel right now. The only difference is it feels like the truck DID hit me, and the only place I slide when I feel like that puddle of goo is into my bed. I was tired the last time around, but this is next level. The timing probably isn't helping anything. Last week was our busiest week of the year at work...Masters week. And, this year, we got a double dose with two separate days of tornado-spawning severe weather tacked on. I once came into work with a kidney infection and bronchitis, but I was so tired, nauseous and capri-sun-puddley on Tuesday, I took a half day. THAT is the level of exhaustion I'm talking about. Thursday...I woke up after 8 hours of sleep to go to the gym. Realized it was just too daunting. Snoozed for another 30. Went to the gym. Left after 45 minutes because I was too tired. Showered. Napped...because showers are exhausting. Went to a board meeting. Came home. Napped for an hour and a half. Drug myself to work...still exhausted. Napped for 30 more minutes on my dinner break. And, I was still tired when my head finally hit the bed. 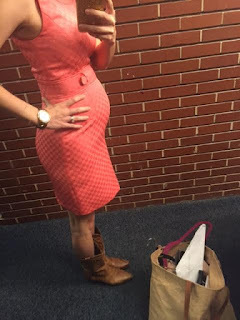 But, I promised myself I would appreciate the 'process' of pregnancy more this time around, so that's enough whining...at least for this one blog post. Which means I'm out of things to say. But, did I mention? We're pregnant! There aren't enough words in the English language to express how thankful I am. All-day sickness, exhaustion, weight gain, and all. I'll take it.